Where to Buy Take Off Sulfone, Take Off Sulfone 5-20-15 Fertilizer - 25 Lbs - $169.95 for Sale with Fast Free Shipping! 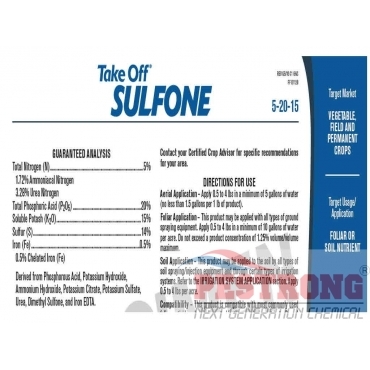 Take Off Sulfone 5-20-15 Fertilizer - 25 Lbs is a concentrated nutrient solution containing, in highly soluble form, certain elements beneficial to plant growth, flowering, crop development, crop quality, yield, fruit set, rooting, root development and transplant establishment. Magnesium Sulfate Heptahydrate (Epsom Salt)..
Take Off Sulfone can be applied as a properly timed foliar or soil application for vegetable crops, tree, vine, fruit crop and field crops. Don't mistake Take Off for a plant growth hormone that affects a limited aspect of plant growth, such as cell elongation. Take Off is different - it works inside the plant, not on the nutrients in the soil as is the case with many other products. Do not use this product with surfactants or adjuvants that lower pH. The effectiveness of Take Off is proven through research on a diverse range of crops, including corn, soybeans, wheat, rice, cotton, barley, alfalfa, tomatoes, lettuce, cantaloupe and switchgrass. (no less than 1.5 gallons per 1 lb of product). 0.5 to 4 lbs per acre. This is a great fertilizer + nutrients for my fruits, vegetables and flowers.